It is now nearly the end of July. The suggestion made at the February groundbreaking for the 6th Street Viaduct that estimates that the bridge would be closed for demolition in July were “aggressive” has proven more than true. The closure of the existing bridge will come no earlier than October of this year, and demolition will begin shortly thereafter. Even so, things are apparently moving along. Representatives from the Sixth Street Viaduct Replacement project have been making the rounds at neighborhood council meetings in both Boyle Heights and the Arts District lately, offering updates on the projects. When asked if the presentations would be made public, staff pointed me to the website, saying they had recently posted some maps and a new fact sheet. The updates themselves are not particularly informative. As seen in the map above, improvements to intersections expected to handle detoured traffic have been underway since May and will continue through August, on the west side of the river, and through October, on the east. The changes include upgrades to lighting and traffic signals, and the reconstruction of the corners for improved pedestrian access. The 12 intersections targeted for improvements — down from 20 in the original plans — are meant to facilitate the traffic circulation pattern seen below. 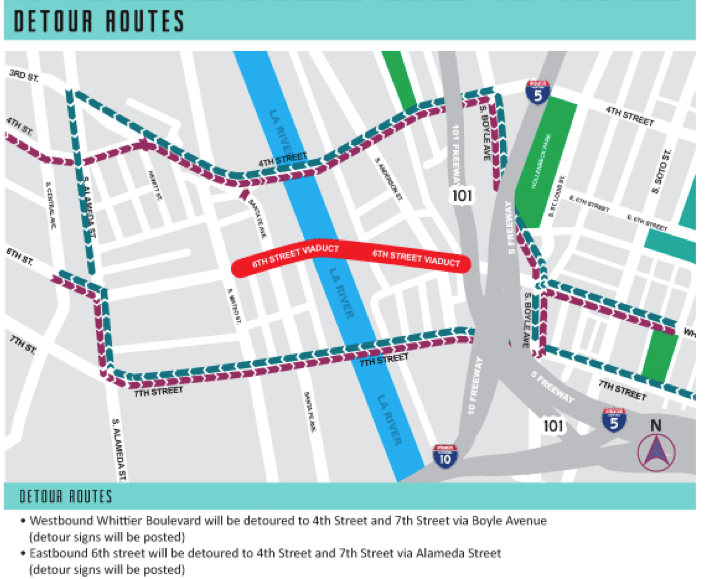 For drivers, the closure will represent an inconvenience, slowed commute times, and, most likely, more crowded crawls along streets like Mateo, Alameda, Whittier, or Boyle. For pedestrians and cyclists, the closure represents a more significant change. 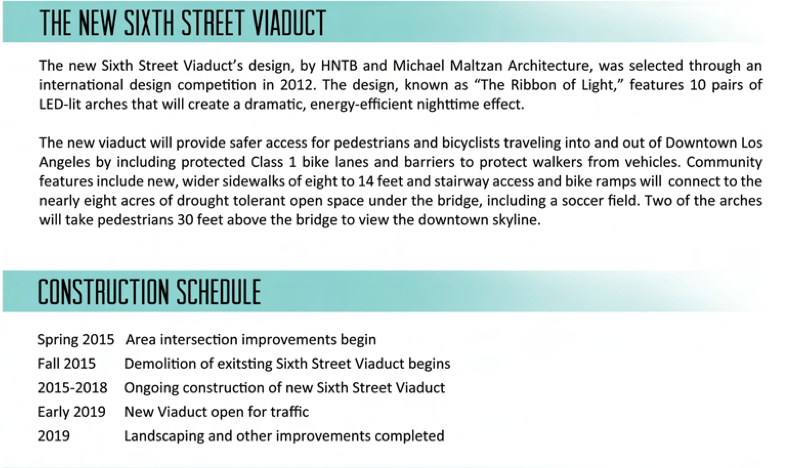 Those that used 6th St. will likely switch to using 4th, as the 7th St. bridge, with its many on and off ramps, is very uncomfortable to cross. And while 4th is a lovely crossing and was recently repaved, no accommodations were made for cyclists or to slow the often fast-moving traffic and no improvements were made to its narrow sidewalks. So, the next few years of waiting for the 6th St. Viaduct to be completed may be a little harrowing for some of us. But it does look like there is a sliver of hope for those cyclists that survive the construction period. Although representatives working on the bridge assured me cyclists’ needs would be taken into account, original renderings of the bridge from two years ago included no bike lanes at all. 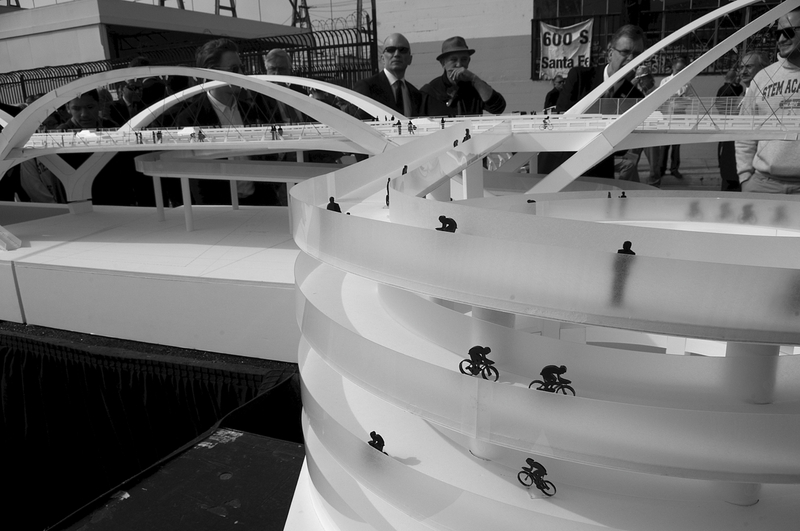 The incredible 65′ model built by Michael Maltzan’s team last year included fake cyclists happily hugging the pedestrian barrier/gutter, but no protected lanes. Cyclists ride unprotected along the reconstructed bridge last fall. Sahra Sulaiman/Streetsblog L.A.
And, on several occasions, I was told there was no money in the budget for a protected lane. Really? 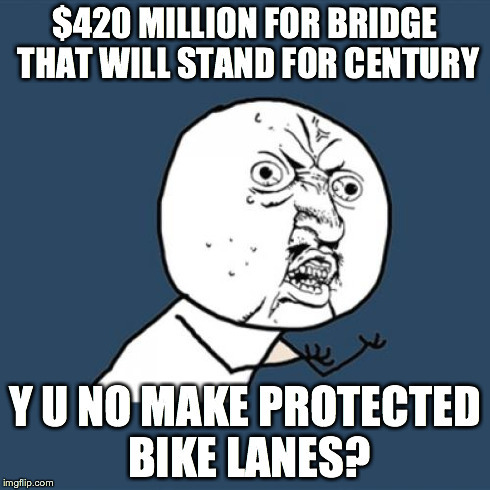 $420 million and you can’t find the funds for a protected bike lane? The omission made no sense. How could Mayor Eric Garcetti, champion of Vision Zero, speak so glowingly of the opportunity the project presented for the city to champion a new approach to streets and transportation and to “change the way we move as people change the way they move” while overlooking the protection of cyclists? 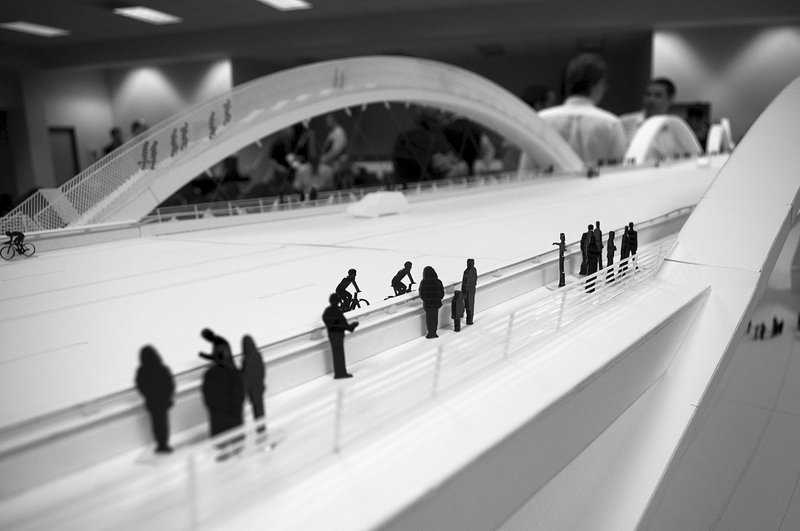 Especially when cyclists featured so prominently into some of the design elements of the bridge, like the spiral ramp (seen below) intended to connect cyclists and pedestrians to the river bed and community below? 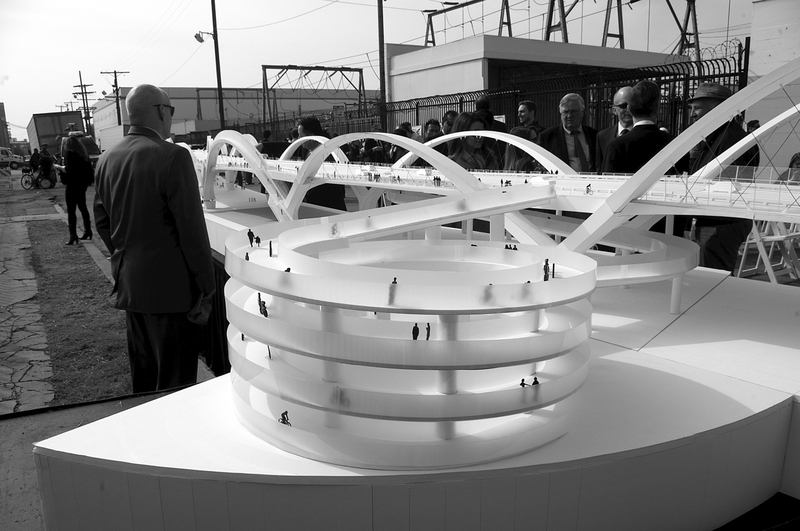 The spiral that will let cyclists and pedestrians access the riverbed, proposed park and soccerfields, etc. from the bridge deck. Sahra Sulaiman/Streetsblog L.A.
Cyclists spiral their way down to the riverbed from the model deck of the 6th Street Viaduct. Sahra Sulaiman/Streetsblog L.A. So, it is comforting to see that cyclists have not been forgotten in writing. The form in which their protection will materialize, however, remains unclear. At the groundbreaking ceremony, I did hear the suggestion that plastic bollards might be the solution, given their relative low cost. It does seem rather ridiculous to create a soaring work of architecture only to cheapen it with plastic bollards, so I’m hoping that the protection will come in a more substantial form. And one that actually serves as protection. We’ll update you when we learn more. For now, track updates at the project website, here. For previous coverage on the project, see here, here, and here. Read between the lines. Because they’re including a sidewalk that is “eight to 14 feet” wide, it will meet the minimum width to qualify as a Class I facility per the standards in the Caltrans HDM [PDF]. Considering that all renderings and models don’t show any other separated facility, I’m pretty sure that that’s what the plan is. Until a completed bridge opens with concrete evidence to the contrary, no one should believe that anything other than a wide sidewalk is in the works. Now granted, such a situation is tenable if transitions to the bridge from other bike facilities are done smoothly and if they remember that Class I means a minimum design speed of 20 MPH. (Probably similar to this Dutch bridge, which actually bears some resemblance.) But don’t get your hopes too high, it doesn’t look like an actual PBL is planned. Thanks Jeff. The spiral down to the riverbed looks like Maltzan has combined cyclists and pedestrians on the same path which will lead to dangerous conflicts. Such conflicts are one of the prime defects that the lawsuit against the City concerning BOE’s approved Option 1 on the Hyperion bridge is addressing. See my comment below, that’s likely your answer. The fact that they can’t even use the correct designation for the facility (“Class 1” instead of Class I) should be a big clue as to what the final product will be. I already saw your answer below. Don’t tell me the same thing again… send your concerns on to the powers that be. I’ve made noise about this every time I’ve written about it, but I’ve never seen a bike advocate (outside of the LACBC) at any of the bridge-related events. No bike-related questions have ever been raised at meetings that I have attended. 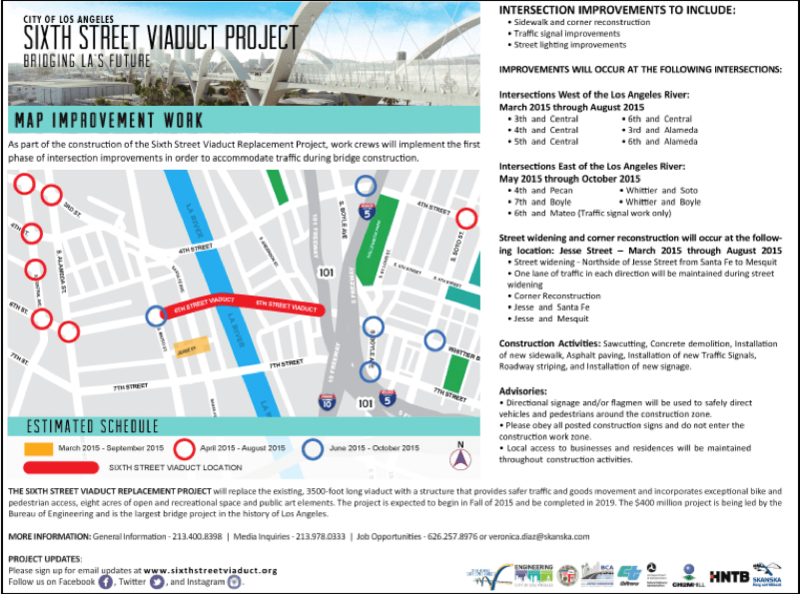 Connect with Huizar’s office, the Mayor’s office, and/or the Sixth St. Bridge folks (General Information – 213.400.8398), LADOT, or the BOE. Or all of them. But especially the mayor’s office… back in 2013, Nat Gale assured me the mayor’s office was tracking the inclusion of a bike lane. I don’t know if he is still the one to ask, but the mayor’s office is a good place to start. Where can we see this artist’s sculptor piece? I’m a big fan of his work and would love to see it! I’ve spoken to Huizar’s deputy about this, face to face. Firstly, there is no additional cost to having a protected bike lane, because it would be a simple matter of moving the pedestrian barrier over to the left of the bike lane so it protects both cyclists and the sidewalk. But LADOT wants a place where broken-down cars can pull over to avoid blocking car traffic (that’s what I was told). So they’re putting in a shoulder and calling it a bike lane: aka no real bike facilities.